I want to find out how to profit from the "blue gold" boom... a metal that’s even scarcer than lithium. Supply of it has become the energy industry’s #1 concern, as it makes up as much as 60% of the overall raw material in the batteries powering electric cars, homes, trains, and entire power grids. Whereas lithium makes up a significantly smaller percentage of the raw material... as low as 2% by weight in some batteries. With demand soaring, experts are predicting a 503% supply shortfall in the coming months. America produces less than 1% of the world’s total “blue gold” supply. And the little sub-$1 company Keith has discovered is sitting on over $1 billion worth of this ultra-rare metal... right here in the United States. This tiny company is America’s sole primary, near-term producer of this incredibly rare material. That makes it a prime candidate for a major supply deal... or even a major buyout! I am excited to learn about the small “blue gold” player that can bridge the upcoming supply gap and deliver once-in-a-lifetime gains to timely investors. Please send me my free report, “How To Bank 1,000% on the World's 'Blue Gold' Rush,” immediately. This report includes all the information I need to secure fast gains from the explosive little “blue gold” companies that will become tomorrow's big players. Quick Profit e-Alerts — I'll get flash updates from the energy field on the latest moneymaking scoops via profit alerts. These obscure recommendations will be delivered straight to my inbox seconds after they're written, as these profitable opportunities arise. Regular Portfolio Updates — I'll know exactly what's happening with each profit-making play in Keith's model portfolio with regular updates on any news that will send the stock soaring further or when to sell for maximum profits. Members-Only Website Access — With my own username and password, I'll have access to a secure online platform exclusively for members where I'll be able to find archives of Keith's no-nonsense research reports, commentary, picks, and current portfolio. I'll even find fast-track commentary on how to get the most out of this service. Free Subscription to the daily e-Letter Energy and Capital, where I'll find the latest in breaking news and market commentary, so I know how to shape my investment strategy in the weeks and months ahead. Access to VIP Service — A subscription to Pure Energy Trader qualifies me for VIP service. I can contact the VIP team with any questions at (844) 310-4115. In addition, I'll also receive any new research reports published by the Pure Energy Trader team in the future. I understand I’ll get my risk-free trial subscription to Pure Energy Trader for a special discounted price of $1,499. As always, I have a full 30 days to decide if these types of profits are right for me... and my free special report, as well as any other intelligence I gather during this time are mine to keep — no matter what. I get to keep everything even if I decide to cancel during my trial period, minus a small 10% tire-kicking fee that gives me full, unfettered access to Keith's advisory. As long as I'm a member of Pure Energy Trader, I will get every single Energy Investor issue as well — absolutely free! That's every Energy Investor report, every alert from Keith, full portfolio access, and much, much more! 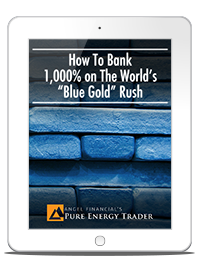 Special Report: "How To Bank 1,000% on the World's 'Blue Gold' Rush"
Unlimited Access to the Private Members-Only Website... For Life!